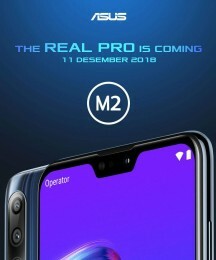 Asus Indonesia tweeted out an official teaser for the Zenfone Max Pro (M2), which is slightly misleading and tries to suggest that the phone has a triple camera, even though it doesn’t. We saw as much in the leaked video review. The second generation Pro will be unveiled on December 11 and the tweet makes a big deal about the battery. It also promises a gaming flavor with a hint of a more performant chipset. It even goes as far as using a #NextGenerationGaming hashtag. The notch has officially landed on Asus’ mid-range series, previously used in the premium Zenfone 5 duo. Interestingly, front camera will be joined by an LED flash, which will help out in late night selfies. The Asus Zenfone Max Pro (M2) will be unveiled on December 11 with stock Android (but not Android One).